Summertime is right around the corner and, with that, comes the bulk of AAU national championship season. The AAU is constantly adding new events and new competition opportunities for youth athletes and, in recent years, a larger focus has been placed on developing the whole event – not just organizing a tournament. More than 30,000 athletes across the nation collide in Orlando for the largest youth volleyball event in the world. The event attracts 80,000 spectators, 9,000 coaches and more than 500 college coaches to ESPN Wide World of Sports Complex and Orange County Convention Center. Oh, and who could forget, there’s an exclusive AAU Water Park Party at Disney’s Typhoon Lagoon Water Park during the event! Select championship games stream live on WatchESPN.com. AAU national championship season concludes with the largest multi-sport festival in the United States. The 10-day event features 18 sports competitions, including the AAU’s marquee track and field event. Nearly 250 AAU Track and Field national records have been set and reset at the Games since 2011, including two national records by 15-year-old star Brandon Miller in 2017. The 2018 Games will be streamed live at FloTrack.org for the second consecutive year. Plus, you never know what decorated Olympians will be on hand for this event! The last qualifying event for the AAU Junior Olympic Games, AAU Club Championships bring more than 5,000 runners to the starting line at ESPN Wide World of Sports Complex. Run the same track as three-time Olympic gold medalist LaShawn Merritt and former world’s fastest man Justin Gatlin. Preceding the AAU Club Championships is the AAU Primary Nationals for ages 8-and-under to compete in their very own national championship events. Select days stream live on WatchESPN.com! The AAU makes its way into Disney’s newest sports venue, The Arena at ESPN Wide World of Sports Complex, with the AAU Scholastic Duals. Coaches love this event because it gives athletes the opportunity to improve their skills during the offseason against some top national talent. More and more female wrestlers continue to register for this event, so the AAU is excited to provide a unique competition venue for female athletes in this sport. More than 10,000 athletes will go head-to-head for bragging rights in the AAU Boys Basketball National Championships and Super Showcases. Widely considered the proving ground for the next generation of college and professional superstars, athletes will compete in the very same events that groomed NBA stars such as Dwyane Wade (Miami Heat), Chandler Parsons (Memphis Grizzlies), two-time NBA MVP Stephen Curry (Golden State Warriors) and 2016 NBA Champion Kyrie Irving (Boston Celtics). Select championship games at events held at ESPN Wide World of Sports Complex air live on WatchESPN.com! The best in amateur athletics head to the famed New York Athletic Club in April for a ceremony crowing America’s top amateur athlete. World renowned golfer Robert “Bobby” Jones received the inaugural award in 1930 and swimmer Anne Curtis became the first female to accept the award in 1944. Other notable winners include Olympians Mark Spitz (1971), Carl Lewis (1981), Jackie Joyner-Kersee (1986) and Michael Phelps (2003). Former UCLA basketball star Bill Walton (1973) and University of Tennessee quarterback Peyton Manning (1997) have also earned the prestigious honor. Wisconsin volleyball star Lauren Carlini became the first-ever volleyball player to take home the award last season. Watch the event live on April 17 at www.aausullivan.org! Taking place annually since 2002, Jam On It! will attract more than 15,000 athletes to Reno for the largest youth basketball tournament in the United States, the Jam On It! Reno Memorial Day Basketball Tournament. More than 1,000 amateur teams from seven states bring 28,000 spectators for a grand total of 2,104 games all at the Reno Spark Convention Center. The Arkansas-Texas Battle of the Border kicks off again this December at AT&T Stadium, home of the Dallas Cowboys. Attendees will see four youth football games and receive an exclusive tour of Dallas Cowboys’ facilities complete with one-of-a-kind photo opportunities! Give your athlete the joy of playing on the same field as former AAU James E. Sullivan Award winner Ezekiel Elliott and 2017 NFL Offensive Rookie of the Year Dak Prescott at this year’s Battle of the Borders. Arkansas leads the series at three wins to two, so the stage is set for an epic battle in year six. More than 1,500 gymnasts will tumble down to sunny Florida this year for the annual AAU Gymnastics National Championships in Tampa. The Ladies Division returns in 2018 where, last year, a 55-year-old gymnast competed alongside all the talented youth athletes! 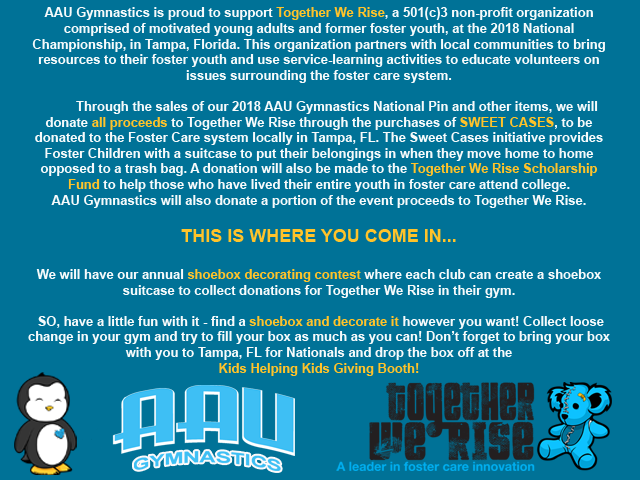 Competing clubs are invited to participate in the annual shoebox decorating contest where each club can create a shoebox suitcase to collect donations for Together We Rise, a 501(c)3 non-profit who partners with local communities to bring resources to their foster youth and use service-learning activities to educate volunteers on issues surrounding the foster care system, in their gym. Soak up the sun this summer in Dodgertown, the one-time Spring Training home of the Los Angeles Dodgers, for the AAU Baseball National Championships. Join teams from across the country for a week of elite competition. Less than five miles from the ocean, the AAU National Championships is perfect for this summer’s family vacation. The newest national championship event in AAU Baseball, the AAU Midwest Championships affords youth athletes an opportunity to compete on 2/3-size replicas of five iconic stadiums spanning the history of baseball. BallParks of America is one of the only stay-and-play facilities in America, so players experience a week rooming with their teammates at the venue’s MLB-style Team Suites complete with HDTV. Don’t miss this opportunity to earn your championship ring in this can’t-miss event. The inaugural AAU National Indoor Pickleball Championships opened this month. In what might be the most unique sport in AAU’s growing portfolio of sports programs – or at least the most uniquely named – this event will be held at the Orlando Sports Center only miles from Walt Disney World Resort. Don’t miss the first event of its kind in AAU history! The puck drops again this July in Corona, California for more than 100 hockey teams around the world, including teams from South Korea, Great Britain and Mexico. Just minutes from Los Angeles, the AAU Hockey-USARS Junior Olympic Games guarantees a minimum of five games for all athletes from ages 8-to-18. Friends and family who can’t attend can enjoy all the action live in HD at www.aauhockey.org. This event reaches the quarter-century mark in 2018, as the AAU Junior National Beach Volleyball Championships prepares for more than 300 teams at Hermosa Beach. Participants from 25 states, Canada and Puerto Rico take the sand in front of a number of high profile college coaches. Headlining an illustrious group of this event’s alumni are Sara Hughes, recent third-place finisher at the World Series of Beach Volleyball, and Stanford’s Kathryn Plummer, 2018 AVCA Player of the Year and espnW National Player of the Year. Nearly 2,000 athletes will make their way to various locations in California this summer for the AAU West Coast Junior Olympic Games. Paced by more than 270 teams at the beach volleyball event, 2018 will feature competitions in sports such as track and field, baseball, golf, wrestling, karate and dancesport. (Stay tuned for announcements about sports added to this year’s Games). With the exception of beach volleyball (wherein teams must qualify), athletes with a valid AAU membership card are eligible to attend. Located in sunny Fort Lauderdale, the AAU Karate National Championships will offer high caliber athletes an opportunity to compete against some of the very best around the world. Athletes, officials and coaches have the opportunity to experience this great event while creating lasting friendships. The event kicks off with a day-long training session for coaches and officials along with a clinic for athletes hosted by some of the most prominent karate-ka instructors in the world. Come early or stay late and enjoy all that Fort Lauderdale has to offer! Perhaps the best-managed taekwondo event in the U.S., the AAU Taekwondo National Championships off quick and efficient check-in and weigh-in stations to produce precise staging times in front of a full cadre of National and IR Officials. The Olympic-Style Black Belt Team Divisions are total PSS and serve as the qualifying event for the most competitive athletes for all AAU Team Members. Just a few hours away from Disney and the Florida Keys, this event is a kick for the whole family! Take your team(s) to experience some of the greatest family vacation destinations in the world with AAU Girls National Championships and Super Showcases this year. From Honolulu, Hawaii to Orlando and Gatlinburg, Tennessee to Las Vegas, the AAU Girls Basketball National Championships and Super Showcases are a three-point score for the whole family! More than 500 teams will compete in exceptional venues in these extraordinary destinations on some of the same courts as WNBA legends Maya Moore, Sue Bird and Tamika Catchings.